Lately, life has been incredibly demanding. I’ve mentioned it before, but David and I are under so much stress. Thankfully, things are beginning to look better and we’re starting to see the light. I’ll talk more about that in a few days. But all of this stress has really made David and I think about the type of life we want and need. It’s been almost five months since Bernice moved in. Some things have been easier than I expected and some things have been far more difficult than I imagined. Of course, David and I love and care for Bernice, but it has been a challenge at times to not lose our minds. She keeps me busy or exhausted most days and, until recently, I haven’t had much of a break. She wants laundry done every day. I don’t have time to take care of her and the things going on in the house. It’s all overwhelming. And David and I have found ourselves more and more burdened by our things. I have entire areas of the house I don’t even step into for weeks at a time. If I haven’t used those things in those rooms, why do I need them? They’re just one more thing, on my already full to do list, to maintain. I resent my things. And I find myself craving a simpler life. So I spend my time pouring over small cottages and bungalows. 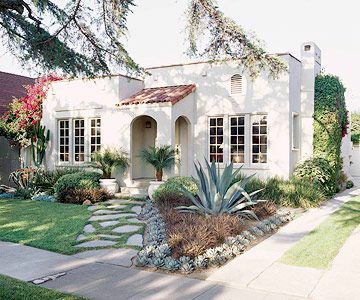 Looking at their dreamy yards and bright spaces. The challenge of fitting our over sized life into a smaller existence, exciting me. Imagine, having the entire house clean in a day. Or opening my closet and not finding junk stuffed in the corners. *sigh* Better yet, stepping out into the backyard for my morning coffee (*cough* early afternoon) and being surrounded by the smell of garden roses. It sounds so nice. And I do enjoy dreaming just a little bit too much. So, for now, David and I will stay where we are (which we are very happy at), but today, I’m going to play pretend and dream about living in these adorable bungalows.